I had a looooong day at Addenbrookes yesterday. A plus side to the visit was that I didn’t have to fast, so with breakfast in my belly and armed with a coffee I showed up just before 9 at the clinic ready to get on with things. First off were the observations (blood pressure, heart rate that sort of thing) then blood taking. The lady who took my blood yesterday was amazing, I didn’t even feel a thing which was a bonus, I'm somebody who sometimes comes out looking battered and bruised after having blood tests done. Then a pregnancy test again. It’s funny they are always very apologetic with these things, but it totally doesn’t bother me, it's all for science. When all of that was done I saw the EDSS assessor again. She again was apologetic that I will have to do the same tests all the time. I am looking at it like a challenge to see if I can remember in which order to do the things for next time instead. After this I saw Dr Nick. This was the doctor who I had talked to on the phone at first so it was nice to meet him in person. Dr Nick gave me the prescription and warned me that the pharmacy dealing with the clinical research bit of things are quite busy and it is good to get the prescription in as quickly as possible. We spoke a bit about how the dosage was counted, they take your weight and height and work it out to see how much you should tolerate. In my case it is 7. That’s seven of the huge things. They are to be taken in the evening before bed and I shall start doing so in exactly a week’s time. Dr Nick also gave me some diaries to fill in making sure I list all the drugs I take. I am gonna need a bigger pill tray as there is no way I can fit 7 of those big monsters into the current one! Ok paperwork done and I was sent off to the pharmacy, this is conveniently located next to a café, so I dropped the papers off, told them I would be back in a few hours as I had some more tests done and sat down with (another) cup of coffee and did some work for about 2 hours. Then it was time for some Visual Evoked Potentials, I have had this done once before way back when I was first diagnosed. Mostly I remember them as being mildly boring, confusing and sticky. The sticky part is compliments of the glue that they use to get the electrodes on to your head. Karen the research nurse had given me directions to get to Neuro physiology. But my brain can’t cope with directions that include more than first to the left then to the right. So I wandered off to reception and asked them to point me in the right direction. I think they could do with an internal google maps at this hospital, it's really confusing! 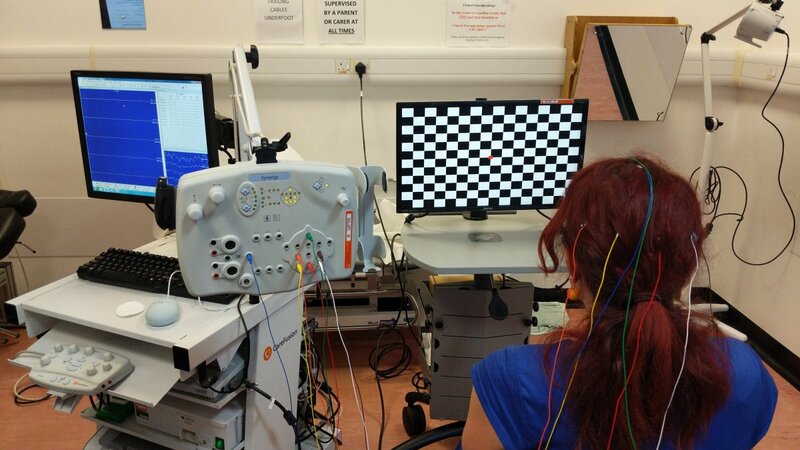 Once in the Neuro Physiology lab I got glued up by a lovely and very funny technician, I am quite geeky so I was asking her lots of questions about how it actually worked and what they were looking for when they study the screen. I find it super interesting how it all works. But I won’t bore you with that, what I can say is that she could easily tell when my mind started wandering and I wasn’t staring quite as intently at the red square on the checker board. You can read more what it is like to have the test done here. After you have stared at those squares moving around for an hour, you’ll see squares in front of your eyes for a while. But I didn’t have time to be annoyed about that as I had to get my running shoes on and dash to jump into an MRI scanner. These are terribly boring to have done, and I get awfully stiff, but apart from that it was ok. I have had a panic attack in one of those things once and it wasn’t pleasant. It felt like after staring at squares jump around on the screen and the donk-donk-donk of the MRI that I had been to some dodgy rave party. Funnily enough, now it was time to go back to the pharmacy and get my drugs. Or are they drugs? I don’t know yet, as I am in with a 50% chance of it being the placebo! See you next week when I shall start taking the drug and let you know how I get on!